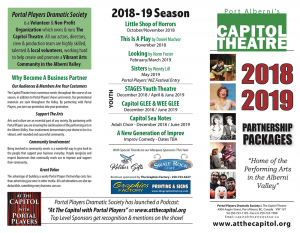 Portal Players Dramatic Society has officially launched its 2018-2019 sponsorship campaign for individuals and businesses. Being distributed to businesses in the coming week, our Sponsorship Brochure can be downloaded now. Sponsorship levels start at $129 for our Individual Patron support level, which includes a season ticket ($69 value), a Portal Players membership for the year ($10 value) and a $50 tax receipt. Business sponsorships start at just $250 and include generous benefits, including promotional mentions and tickets to our shows. Check out the complete list of sponsor benefits in the brochure. Download our brochure (PDF), and please help to support Portal Players Dramatic Society. Thank you! “Little Shop of Horrors” Tickets Available Now! Portal Players Dramatic Society launched its new season of plays on October 17 with an Opening Night Fundraising Gala & Raise The Reds event at The Capitol Theatre. With thanks to major sponsors Koliber Gifts and Swale Rock Cafe, we unveiled our brand new Red Main Stage curtains. Thanks also to funding partners: AV Community Foundation, Little Bavaria Restaurant, Catalyst Paper, and many individual donors. Little Shop of Horrors plays on select dates through to November 3. Tickets are available now for this show; season tickets for the entire series of plays are also now available. Select Dates October 19 to November 3 (all seats $25 each + fees). Any seats available at the door on show nights are $30 each. Season Tickets are now available which includes Little Shop of Horrors, at a cost of just $69 + fees – a savings of $10 over buying individual advance adult tickets. 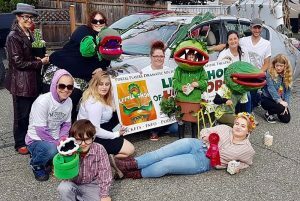 Portal Players’ incredible Fall Fair parade team promoting Little Shop of Horrors. 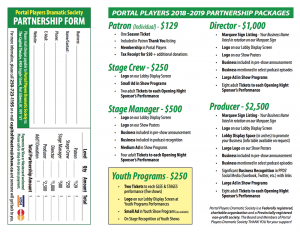 Individuals can also purchase a Membership Patron Sponsorship Package for $129 (only available at our Capitol Theatre Box Office) which includes a season ticket, a membership in Portal Players to support us and receive our updates, and a $50 tax receipt. These and other business sponsorship packages are available by contacting Portal Players as listed below. Portal Players Dramatic Society is back with a new episode of “At The Capitol” featuring special guests Brent Ronning, President; and Elliot Drew, Treasurer; in conversation with host Peter Wienold, coincidentally Vice President of the organization – recorded live in The Capitol Theatre Member’s Lounge. Left to right: Brent Ronning, Peter Wienold, Elliot Drew. The trio are first excited to announce the plays in Portal Players’ upcoming 2018 – 2019 season, and when Season Ticket sales will start. Then they discuss this year’s Sponsorship Campaign for individuals and businesses to help support this volunteer-run organization and theatre continue operating and contributing to a vibrant Arts Community in the Alberni Valley. The season kicks off in October with our production of “Little Shop of Horrors”, and a very special Opening Night Fundraising Gala has been planned for October 17th. It will be the first public unveiling of The Capitol Theatre’s brand new main stage curtains, as we “Raise The Reds”. Fundraising continues to fund the $16,000 project, and after three years of doing just that, Portal Players was able to make in installation happen for the new season. More details will be released soon, as will online ticket sales. Entry is $50 to this special fund raising night, which includes a $25 tax receipt, nibblies and a chance to meet the cast following the show. You can even donate more for an even larger tax receipt! Our annual Sponsorship Campaign has kicked off – hear all about how you and your business can benefit from partnering with Portal Players on this episode. And a special shout out to our season sponsors so far, The Swale Rock Cafe, Koliber Gifts and The Graphics Factory. High level sponsors are also being recognized on our podcast, so check out our various support levels. Our sponsorship brochure will be going out to all Valley businesses soon, and can also be downloaded now. Lastly, the show wraps up with a quick note about next summer’s Theatre BC Mainstage Festival, which is coming to Port Alberni for the first time. This is the “Provincials” of Drama in BC, with eight productions from across the province coming to perform at the ADSS Performing Arts Theatre next July. More details coming soon. Portal Players’ Annual General Meeting is coming up on Monday, September 24 at 7 pm at The Capitol Theatre – come hear the latest news and get involved if you’re so inclined! Portal Players is producing a series of two one-act plays in November and invites people interested in acting in them to audition. Two more nights of auditions will be held for “Take Five” and “This Is A Play”, both comedies, about which you can read more below. Auditions are being held on Sunday, August 26 and Monday, August 27 at 6 pm, at The Capitol Theatre. The STAGES Youth Theatre Company is taking registrations for the fall semester at The Capitol Theatre Box Office on Monday through Wednesday, August 27 to 29, from 4 pm to 6 pm. The Company One auditions will also be held then – more information on how to prepare can be found below. Our music programs registrations are being held on Thursday, August 30 from 3:30 to 6 pm – this is for our Glee, Wee Glee and Sea Notes choral programs. 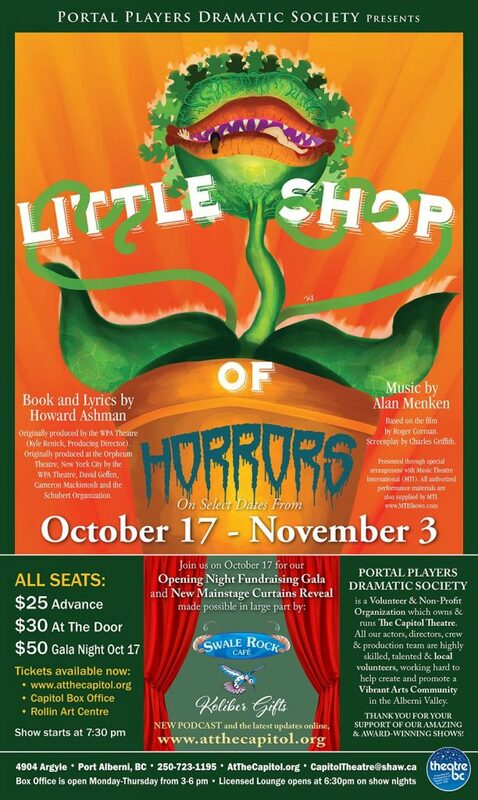 Portal Players’ new season of plays kicks off in October with our production of the musical “Little Shop of Horrors”. Season tickets will be available soon for the entire series of productions at a discounted price of just $69.00 for adults, a savings of $10 on individual ticket purchases. Keep an eye on our website for when they become available. Our annual campaign to partner with local businesses is now underway. This is an excellent opportunity for your business to support the arts while raising your own profile in the community, including shout outs on our new podcast. Affordable support levels start at just $250, with several higher levels available too. Interested? Email us: capitoltheatre@shaw.ca and someone will get back to you. Thank you to our season sponsors so far, Koliber Gifts, Swale Rock Cafe and The Graphics Factory. Another way you can show your support of Portal Players is by attending our Opening Night Fundraising Gala for “Little Shop of Horrors” on Wednesday, October 17. Not only is it our opening night, but we finally be “Raising The Reds” with our new, marquee curtains at centre stage. With grateful thanks to Lily Diotte and our many other funders, it’s a night to celebrate! Tickets available soon. 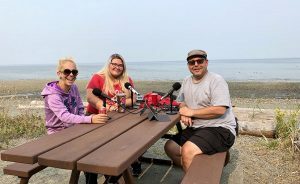 Be sure to listen to our inaugural episode of the podcast, featuring a chat with Carrera Schroeder and Melissa Lowe, talking about days of old and new with Portal Players at The Capitol Theatre. Future episodes include more chats with cast and crew members of “Little Shop of Horrors”, and coming soon we’ll feature Portal Players president Brent Ronning and treasurer Elliot Drew announcing our upcoming season, and on how we work in tandem with the local business community to both our benefit. Finally, if you are new to the Alberni Valley or new to hearing about Portal Players, please consider attending our Annual General Meeting on Monday, September 24 at 7 pm, at The Capitol Theatre. You’ll get to meet many of our members and hear more updates. You may be aware that Portal Players is taking a lead role in organizing Theatre BC’s big “provincials” of drama festivals called Mainstage, coming to Port Alberni next summer. We’re still building the team and assembling a volunteer corps, so by all means, come to the AGM. Portal Players Dramatic Society invites anyone who would like to try acting in either one or both One-Act Plays to be performed at The Capitol Theatre in November, to come to our auditions on August 26 & 27 at 6:00 pm. “Take Five” directed by Dale Hillman, is a 45 minute One Act Play for six adults, four Men and two Women. The play is a hilarious comedy about what can go wrong in live theatre. “This Is A Play” directed by Nicole Saugstad is a hilarious comedy which follows three actors who, while performing, reveal their own thoughts and motivations as they struggle through crazy stage directions and an unoriginal musical score. 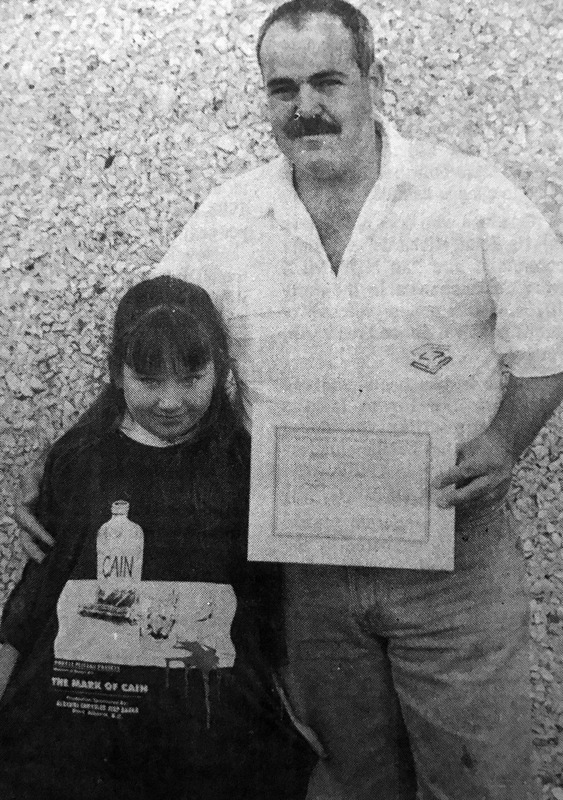 Male Actor – Thinks he’s all that. A little clueless. Female Actor – Thinks she is the “It” girl. Has a rivalry with the Older Female Actor. Older Female Actor – seasoned, was probably the “It” girl in her hay-day. Composer – no gender, thinks they are the best thing since sliced bread. Auditioners must be ages 15 and up. Play features some adult situations/humour so anyone under 18 must have parental consent. The Composer part may or may not be voice over. Please mark a preference on audition page. 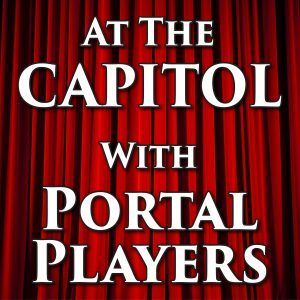 Portal Players is excited to announce that we have just launched a brand new podcast, At The Capitol with Portal Players. 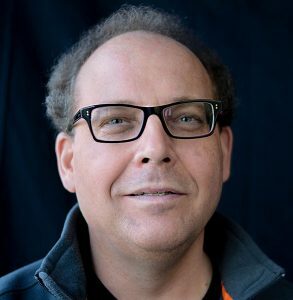 Host Peter Wienold is also on the Portal Players board and has directed, produced and acted with the company on many occasions over multiple decades. Starting soon, we’ll present a series of At The Capitol episodes to tell you all about what Portal Players Dramatic Society is up to. For those of you who don’t know, The Capitol Theatre in Port Alberni is owned and operated by volunteer members of Portal Players. We produce our own plays, musicals & other live entertainment just for the love of it, and we provide educational opportunities through all our programs, & especially through our STAGES Youth Theatre program and our GLEE choral program. At The Capitol will feature chats with our members discussing upcoming shows, auditions, personal profiles and much more. We’ll soon be launching both our season ticket sales campaign, and our business sponsorship campaign – and a note that our top sponsors will get promotional mentions in this podcast! 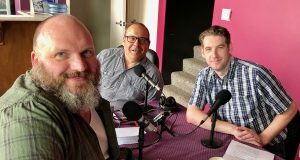 So there’s lots of ground to cover – get a head start by subscribing to the podcast in your favourite app, or just listen online right in your web browser. You can look forward to a new episode of At The Capitol with Portal Players featuring our upcoming Little Shop of Horrors musical, which opens October 17. We hope you are all having a wonderful summer! This post is intended to help answer some of the questions we have been getting about the STAGES Company One production for next year. Our production next year is going to be written by our senior students, the focus of which is totally up to the participants. Naomi Boutwell will be facilitating and helping with the editing process, but the writing and the artistic direction is up to the students. While we have been asked if it will be a monologue show, or a show that follows a linear plot, or if it will be a variety of scenes, we can’t answer that yet as it will be decided by the Company One class. Be about something you experienced that made an impact in your life. It could be something good or something bad. Possible suggestions…getting a new sibling, hearing something that changed your perspective on an issue, the loss of something special, friend drama (no names please), getting your first job, something that you felt was unjust or made you mad, learning to drive, passing a difficult course, or your first time on stage. It’s your choice. Choose something that has emotion tied to it. Be safe. Your monologue needs to be something you are comfortable sharing with the stages company one class and possibly an audience. Please do not include anyone’s real names or disclose anything that would make you feel vulnerable. Be one to two minutes long and you MUST provide us with a typed or written version of the monologue before performing it. Preparation is key, it needs to be memorized. Be for a friend. All the best monologues have a specific audience. The target audience for your monologue is a friend, it should be like confiding in/ranting to/celebrating with a friend. *I have a few monologues that meet these expectations but rather than sharing those right away I would like to hear what you come up with on your own. If you feel stuck though please don’t hesitate to ask and I will gladly send you some examples.